Advanced Micro Devices will ship its next-generation Kaveri architecture by January, executives said Monday evening. Specifically, desktop availability will take place on January 14, executives said at AMD’s APU13 conferences on Monday. Chips for notebooks, servers, and embedded systems will follow later in the year, executives said. AMD executives also announced the performance of the Kaveri—856 gigaflops. 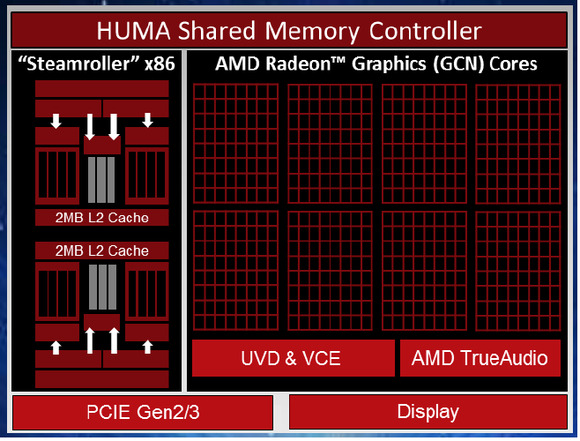 A diagram displayed by AMD appears to show two “Steamroller” CPU cores and eight Radeon graphics cores. AMD executives did not formerly disclose how fast the chips would run, nor how much they would cost. But a footnote on a presentation slide appears to show the Kaveri’s product name (the AMD A10-7850K) with a note that that figure assumes four 3.7GHz CPU cores, as well as 512 GPUs running at 720MHz. While AMD and its much larger rival Intel are constantly seeking ways to constantly improve the performance of their chips, both companies have begun taking somewhat divergent paths toward the same goal. Both now use multicore approaches, where four, eight, or even more processor cores are laid out in parallel and divvy up the processor tasks. Over time, both companies began also building up the capabilities of their integrated graphics cores, which server vendors have found are also excellent at specialized number crunching. On the desktop, those GPUs can also be used for things like physics calculations to improve the realism of games. Together, the CPU-GPU relationship (also known as an APU) is referred to as heterogenous computing. Earlier this year, AMD formalized its move toward heterogenous computing with what it calls its Heterogenous System Architecture—Kaveri will be the first processor designed specifically with HSA in mind. Specifically, Kaveri will include a next-gen technology called Heterogenous Unified Memory Access (hUMA), a technical name for a shared pool of memory between the GPU and CPU. Normally, handing off results calculated by the CPU to the GPU, and vice versa, can take time. Pooling the memory together, according to AMD, speeds up the process and makes the chip as a whole more efficient. HSA is essentially "functional optimization in silicon," according to Dean McCarron, an analyst with Mercury Research, where specific functions get their own optimized cores. HUMA “unlocks the unmatched compute potential and efficiency of APUs,” AMD said. Just under half of the chip will be made up of the GPU logic, AMD said, demonstrating the importance of that piece of the puzzle—and indirectly lauding its own status as a dominant GPU maker. AMD recently launched a less expensive version of its Radeon R9 290X graphics chip, the R9 290. 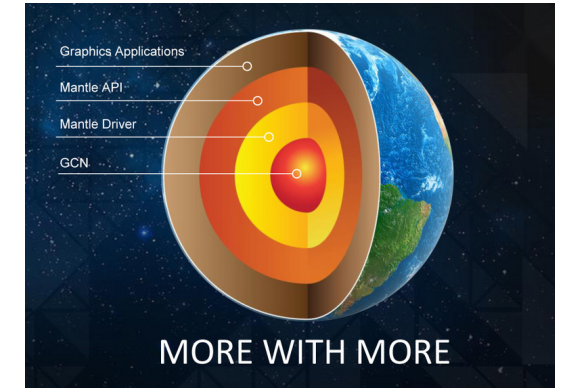 AMD's innovations beyond the chip have included the Mantle low-level API. But Kaveri also brings with it its own set of problems. AMD is already a step behind Intel in terms of manufacturing technology; Kaveri is AMD’s first 28-nanometer chip, but Intel has already moved to the more efficient 22-nm manufacturing node. And next year, Intel will bring to market the 14-nm Broadwell chip, though it was recently delayed. With about 80 percent of the total CPU market, Intel won’t lose its grip anytime soon. Kaveri also promises a leap forward in performance, it will also require new, incompatible “FM 2+” motherboards. Owners of Intel’s fourth-generation Core or Haswell processor will be able to simply swap out the older chip. Finally, there’s the issue of just programming AMD’s new chip to take advantage of its new features. AMD plans to spend a great deal of time at its APU conference educating developers on its new SDKs, which it will release. To its credit, several next-gen titles Xaviant’s Lichdom, and Eidos’ Thief, among others, have already signed on to use AMD’s TrueAudio technology, which will ship with Kaveri as well. Although the chipmaker recently returned to profitability, AMD has been dogged by generations of chips that have lagged behind Intel, dating back about a decade. AMD has only released the bare minimum of details surrounding its new chip. But it also faces an uphill battle to regain its footing.